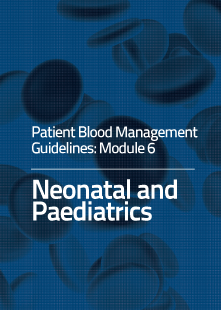 Visit Patient Blood Management Guidelines to access the latest modules in the Guidelines or click on the images below to go directly to the relevant module. Patient Blood Management improves patient outcomes by improving the patient’s medical and surgical management in ways that boost and conserve the patient’s own blood. As a consequence of better management, patients usually require fewer transfusions of donated blood components thus avoiding transfusion-associated complications. The National Blood Authority is funding and managing the development of evidence-based, Patient Blood Management Guidelines. 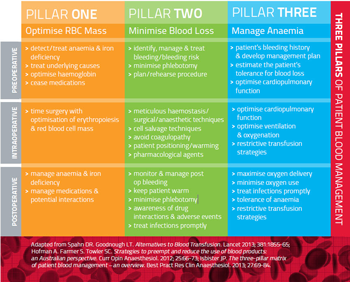 A multidisciplinary team determines, with the patient, the specific management plan, which makes every reasonable endeavour to optimise the patient’s own blood volume, minimise blood loss, and optimise the patient’s physiological tolerance of anaemia. There are various techniques to ensure this. For example, the Three Pillars of PBM  model depicted below helps to show how various practices can be initiated during pre-, intra- and post-operative stages of surgery. explain the benefits and risks to the patient/relatives. Visit Implementing the Patient Blood Management Guidelines to access the latest tools and information to support health providers implementing PBM strategies. 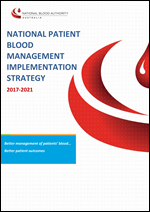 On this page you will also find the NBA's National Patient Blood Management Implementation Strategy 2017-2021. The National Blood Authority (NBA) has established an ongoing committee to provide advice and guidance on strategies to increase the uptake of patient blood management practices in Australia. The PBMSC has representatives from both clinical and government sectors with expertise and knowledge of blood management, the health sector, and quality and safety issues. The work of the PBMSC supports the uptake of the Patient Blood Management Guidelines.